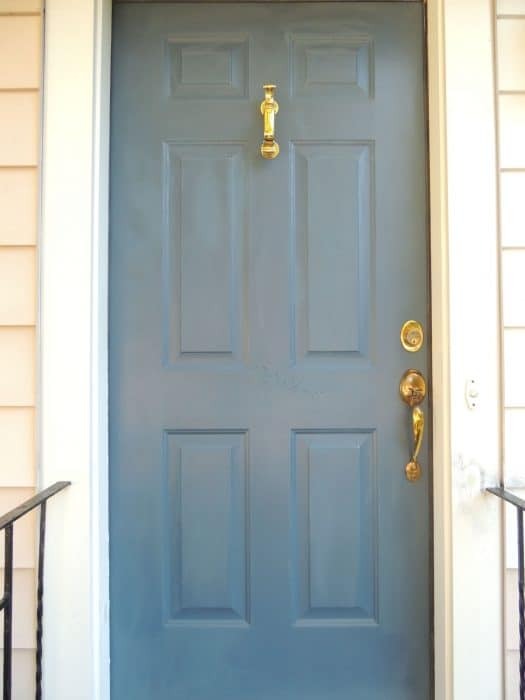 The exterior of my front door got a shiny new coat of paint over the weekend (the inside was painted a few months ago). The color I chose was Naval by Sherwin Williams, a beautiful deep navy blue. I had rollers, a paint brush and a sanding sponge already, so this was a pretty cheap project ($23 total) that actually made more of a difference to my curb appeal than I realized it would. I’m not sure when this door was last painted, but it looked very faded and honestly, kind of dirty too. 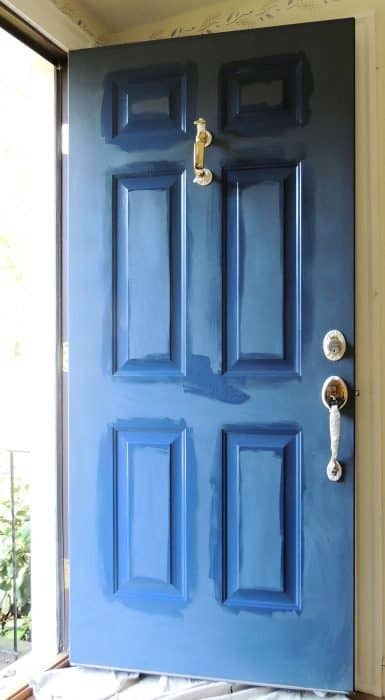 When painting doors (and pretty much anything else) it’s essential to wipe them down first, removing and dust and dirt. Then, give everything a quick sand. I used a sanding sponge but sandpaper is fine too. Then, once more, wipe it down to remove the sanding dust. Now, the logical next step would be to remove all the hardware. However, I’m pretty lazy time-strapped these days, so I just taped everything off…not even with painters tape (because I didn’t have any to hand) but with masking tape. I’m as resourceful as ever! I like to start by painting the panels first. They need to be done with a paintbrush so that you can really get into the grooves. Then using a roller, work on the rest of the door. This shade of blue made me nervous at first, because it went on a really bright blue – almost purple. However, it does dry to a quite a deep navy. I’ve never worked with exterior latex paint before…but it seems to be more latex-y and doesn’t cover as quickly as interior paint. Even with an existing base of blue, I needed three coats before I had a streak-free finish. If you were trying a more severe color change, I would recommend using a primer first. On Thursday I will share all the fun paint colors I didn’t choose for this project (because I’m boring like that)!! There’s some seriously fabulous front doors for you to gawk at! Jenna, the Sherwin Williams Naval looks great! Our front door was a similar color to your before pic when we moved in too :). I’d love to feature this on Involving Color. Let me know if you’re interested! Hey Jena – sure thing…feature away! 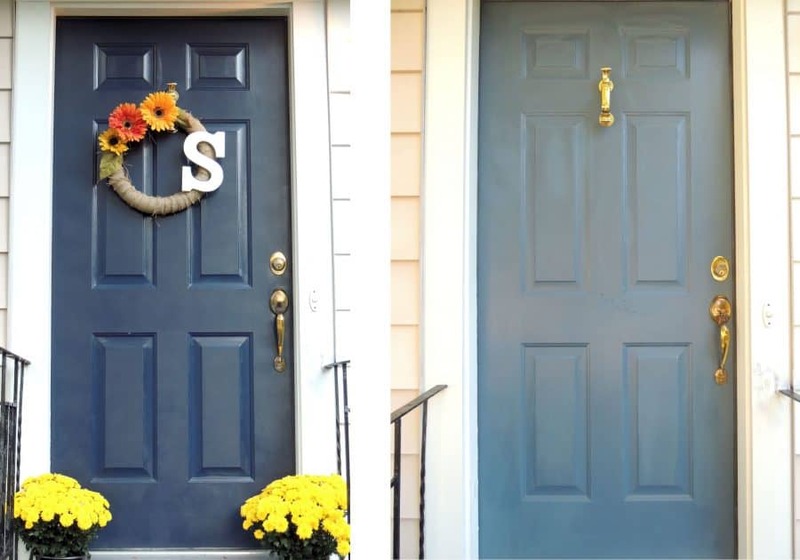 :-) What color did you end up painting your door? That looks so great Jenna! I love the color that you chose! I wish that I could paint my front door and add some new hardware and what not, but sadly I am in an apartment! I’ll just have to live vicariously through you and your front door. Haha! I love it, Jenna! 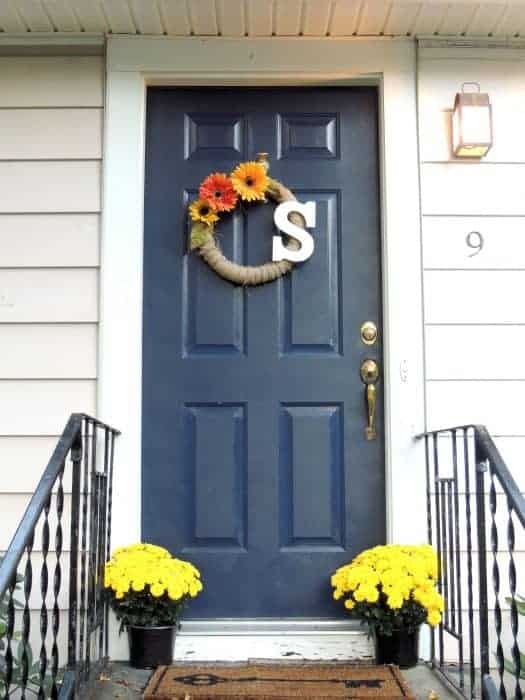 It looks adorable with the wreath and yellow mums. Hi! I am visiting from the Blogiversary! I am also a co-host this week! Like you, I taped my hardware when I painted my front door (red). It needs to be repainted, but this time, I plan to take out the hardware when I paint — I plan to spray paint the ugly gold doorknob and lock black! Nice to meet you!